"With only four ingredients, this very flavorful omelet melts in your mouth!" Preheat oven to 375 degrees F (190 degrees C). Arrange bacon on a baking sheet. Bake in the preheated oven until just crisped, 10 to 12 minutes. Beat eggs and water together in a bowl. Let the bacon cool on paper towels, about 5 minutes. Break into small pieces. Spray a 10-inch non-stick skillet with cooking spray. Melt butter over medium heat until foaming, about 2 minutes. Add onion once butter is no longer foaming. Cook and stir until tender but not browned, 4 to 5 minutes. Increase heat to medium-high. Pour eggs into the skillet and cook until mostly set, about 2 minutes. Lift the omelet with a spatula as the center rises; tilt the skillet so that uncooked eggs run to the center of the pan. Cook until set, 2 to 4 minutes. Sprinkle bacon pieces onto the omelet and fold in half using the spatula. You can cut the omelet in half for easier maneuvering before serving. Great recipe, however omelettes only require 2 large eggs. This makes the portion smaller and easier to handle in the pan and also with plating. i added cheddar, but delicious! I used two eggs instead of three and added some grated cheese to the omelet with a little on top. It turned out great. Excellent bacon egg combo and the onions were key! Played with the idea of adding cheese but I think it would have taken away from what is a marriage made in heaven. You can't go wrong with bacon and eggs in just about any form! 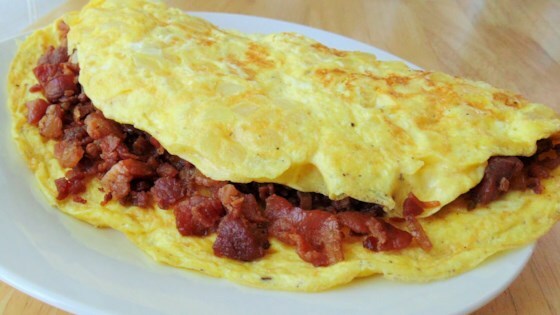 This omelet is really enough for at least 2 people unless you have a really big appetite.